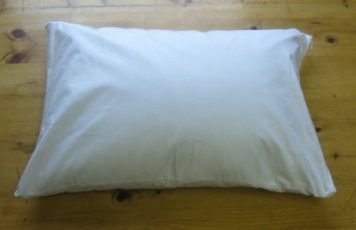 A high quality organic buckwheat pillow handmade in the USA using only the finest available non-fumigated buckwheat hulls. Aromatherapy in (or with) the pillow and premium pillowcases are options. 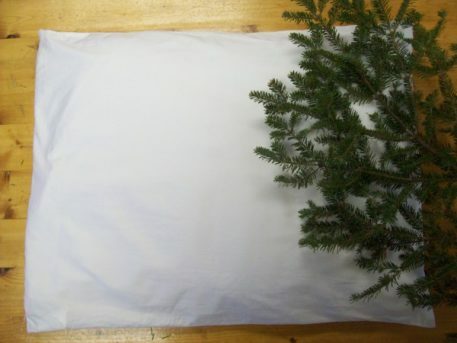 An organic buckwheat pillow from L-OMA is a high quality organic buckwheat pillow produced in Maine. Because an organic buckwheat pillow conforms to the head, neck and spine, extra comfort is realized which optimizes the sleeping position. The organic buckwheat hulls allow for the circulation of air providing for a cooler pillow. Additionally, we have had NO cases of any allergic reaction to buckwheat hulls ever reported. Unlike some of our competitors, our organic buckwheat hulls are non-fumigated and are the finest available on the market. 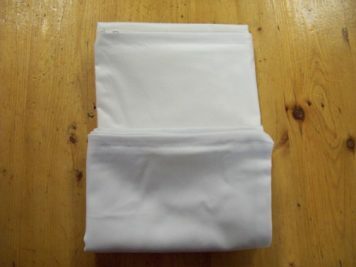 Pillowcase: 100% cotton, white. 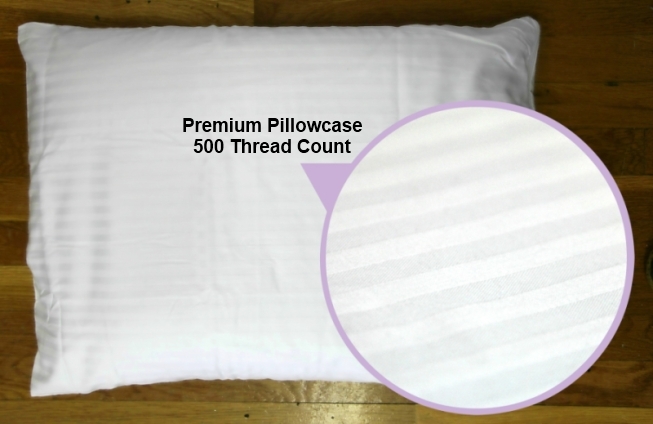 Choose the Premium Pillowcase option if you would like a 500 thread count outer pillowcase. Aromatherapy options You can have lavender, balsam or a mix of both either mixed into your organic buckwheat pillow or have it included separately so you can mix it in yourself. According to some local aromatherapists, a mixture of both the lavendar and balsam can actually multiply the beneficial effects of each. They say the scents compliment each other, so you get more of a relaxed feel as well as more of the healthy benefits of the balsam. An organic buckwheat pillow conforms to the head, neck and spine and forms a contour that optimizes the sleeping position and thus allows for a more relaxed sleep. People experiencing sleep disorders such as sleep apnea and insomnia have found an organic buckwheat pillow to be especially helpful. Menopause Hot Flashes and other Night Sweats are addressed as the air flowing between the organic buckwheat hulls provide for a cooler pillow. We haven’t had any cases of an allergic reaction to our buckwheat hulls ever reported. In the Far East where buckwheat pillows have been used for centuries, users claim they experience relief from headaches, back pain, snoring, neck pain, migraine headaches, tension, muscle pain, stress, and other problems associated with sleep apnea. We’ve also heard of them being used to assist in nursing, as an aid to sufferers of sleep disorders. 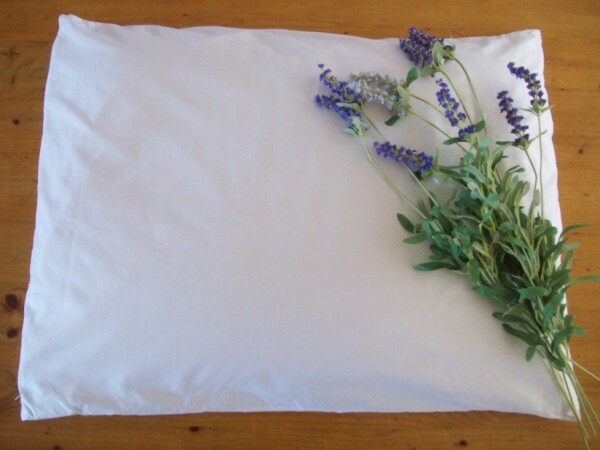 Users of the L-OMA organic buckwheat pillows have claimed they wake up more refreshed and without the stiffness sometimes associated with standard pillows. Good-bye to Chronic Neck Pain. Since a car accident 15 years ago, I have suffered from chronic neck pain. I have done physical therapy, massage therapy, take muscle relaxants, suffered arm numbness, and have spent hundreds of dollars on pillows “guaranteed” to alleviate my neck pain. Then I saw your pillow at the Common Ground Fair this September and tried it. I knew as soon as I tried it that it was different. There was support, yet it allowed my neck to be in a NATURAL position, unlike all of my other pillows (that are now a thing of the past). I purchased my pillow on September 24th and my neck pain literally vanished. It is now October 18th and I feel like a new woman. I feel like shouting from the mountaintop, “Buy this pillow!” I am absolutely free of pain, and my neck feels better than it has in 15 years. I have always been a side sleeper, but I can even sleep on my back with your amazing pillow. I have told everyone I know how this pillow has changed my life. And I love, love, love the fact that the proceeds support the disabled. Your buckwheat pillows have changed my life. My name is Kimberly and I was referred to your company by my acupuncturist who suggests your products for all of his patients. Your buckwheat pillows have changed my life. I am finally able to sleep comfortably and have been afforded significant pain relief. It warms my heart to know that all purchases support a non-profit which provides employment opportunities for individuals with developmental disabilities. I loved the handwritten tag included with each item listing the name of the individual who personally filled my pillow. Very pleased with my L-OMA pillows. I want to express to you just how pleased I am with my L-OMA pillows from you. I have spent HUNDREDS of dollars over the years on down trying to get the right feel by filling the ticking with just the right amount; Tempur-pedic pillows in many sized and shapes; the My Pillow and many many more. This pillow fits me in EVERY position. I am a side sleeper and this conforms to however or whenever I twist and turn throughout the night. I burn hot most of the time and this pillow NEVER gets hot or uncomfortable. Truly an amazing product to have as fill in a pillow. It is also a benefit knowing I am assisting a worthwhile endeavor by helping to support mentally handicapped kids and their training to be responsible adults. Thank you for your wonderful product and excellent customer service. So happy I ordered this! I’ve had my pillow for several months now, so I feel like I can now write a good review. Like many others, I have searched high and low for a pillow that works for me. I have finally found it! I LOVE my buckwheat hull pillow from L-oma. I can mold it perfectly to a comfortable, supportive position–and it stays in that position! I am not waking up during the night constantly having to readjust my pillow. I am a side-sleeper and I find that my neck and shoulder area is less stiff when I wake up. Yay! It is heavy compared to pillows made of other materials but that doesn’t bother me in the slightest. I have read reviews of other buckwheat hull pillows on Amazon and some people commented on the “crunchy” sound. Yes, there is a soft crunchy sound but I got used to it quickly and now I don’t notice it at all. It never did bother me enough to keep me from falling asleep or anything. I bought the bag of lavender separately, as I wanted to try the pillow with and without. Without the lavender, there is a slight, neutral scent to the buckwheat hulls–hard to describe but sort of organic and non-offensive. I love it with the lavender. Smells heavenly and lavender helps you relax. The bag I got of the dried lavender flowers was huge! What a great value! The pillow itself was a good value too. I priced other pillows of similar size and many were far more expensive. Coincidentally, just like another reviewer here, I came to this L-oma site after reading the review from the customer on Amazon about how L-oma’s pillows used non-fumigated organic buckwheat hulls grown in the US, whereas other companies did not. Additionally, I was so pleased to buy from a non-profit business that supports people with disabilities by providing training for work opportunities. I got a card in the well-packed box stating that my pillow had been made by Matthew. Thank you Matthew! It is great! So glad that I did my research. I found out about buckwheat pillows from a local Japanese shop. I figured I would buy a pillow online to save some money and have more options. I was reading reviews on Amazon about an organic buckwheat pillow, and found out that pillows can be labeled organic even if they are fumigated. Yuck! The reviewer had done their research and L-oma was one of the few companies that offer non-fumigated organic bwh pillows. 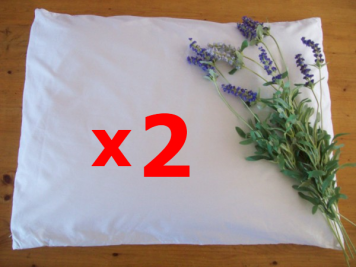 For this size pillow the other companies charged more, in addition to charging for shipping. My decision to go with L-oma was even easier when I read about this company’s mission. I got my pillow yesterday, and I don’t normally rush into reviews. However, I found myself returning to my bedroom several times throughout the afternoon just to use the pillow for a few minutes. My night with the pillow was wonderful. I went to sleep on my side, then after a quick midnight bathroom run I was able to sleep on my back. I NEVER sleep on my back because my neck gets out of whack. I woke up with my entire body feeling the same (stiff, needing a good morning stretch session) EXCEPT for my neck. My husband enjoyed his too. You can adjust the pillow to whatever level of support that you need. I wouldn’t describe it as hard or soft, just supportive. The blend of lavendar and balsam was nice, a very woodsy smell. The pillows come wrapped in a plastic bag. This was essential because we have had a VERY rainy spring so far. There is a tag with each pillow with the handwritten name of the person who assembled the pillow. Thanks Matthew! There are two zippered cases, one that contains the buckwheat hulls and one that serves as a pillow protector. You will want to use a regular pillow case as well over these. The pillow cases are 100% cotton and apparently do not have harmful substances in them according to the tag. I love these pillows, and I plan on gifting them to family and friends over the years. My only recommendations are to provide more aromatherapy options and to offer between-the-knee bolster pillows. My husband bought me a buckwheat pillow about 2 years ago as I suffered from headaches and usually awoke with one. I have not awoken with a headache since I started using the pillow. I also suffer from RA and neck pain and this pillow has helped tremendously. I take it everywhere when we travel. I am now ordering myself another one for a spare. My husband has been looking to replace his old buckwheat pillow and we ended up deciding to take a chance and order from your site. The shipping was fast, the quality was excellent and it was beautifully presented. I will definitely recommend this site to others and would purchase from this site again.